The Chess Master is a breed of mouse found in the Rodentia region. They are known to drop Ancient Relic, Master Bindings and occasionally, Zugzwang's Left Sock, as loot. Hunters are transported to the Seasonal Garden upon catching the Chess Master. Atop the tall tower, in the midst of an isle of madness, sits the maddest mouse of them all: the Chess Master. The Seasonal Garden and the Tower answer to his whims, changing with his mercurial moods. Behind his glowing white eyes lies the mind which produced the rage of the Technic King, and the cold brutality of the Mystic Queen. The Chess Master has the potential to create anything- but he is more likely to destroy everything. Chess Master mice have been found to be especially attracted to Checkmate cheese, to the point that any other kind of cheese will simply not suffice. 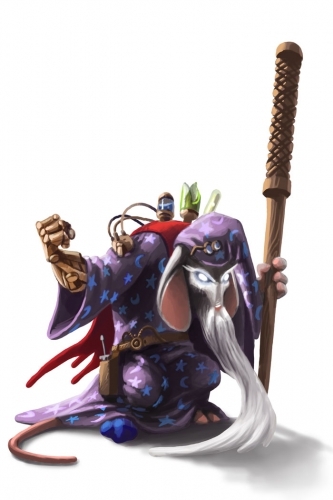 The weaknesses of the Chess Master mouse differ slightly from most others in the Wizard's Pieces group. Tactical weapons are very effective against it, and all the others are ineffective. It is only available to attract after a Mystic King or Technic King mouse has been caught with Checkmate cheese. The Chess Master is pictured wearing one sock on the right foot; its mate is Zugzwang's Left Sock dropped as loot. The Chess Master began dropping Ancient Relic as loot on 29 August 2012. This page was last edited on 23 November 2016, at 15:12.